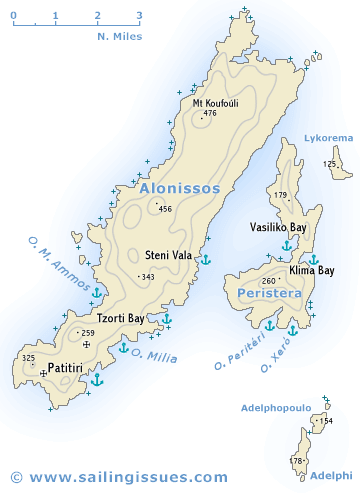 Alonissos sailing and yacht charter guide - Allonisos or Alonnisos Island holidays and charters. The long rocky island of Alonissos - Αλόννησος or Alonisos, Allonisos (formerly Khiliondromia; ancient Ikos), still one of the most remote places in Greece, lies half-way along the chain of the Northern Sporades and is the only inhabited island in the NMPANS (National Marine Park Alonissos, Northern Sporades). A ridge of hills runs along the island from end to end, reaching its highest point in Mount Kouvouli (476 m). The north-west coast is edged by steep cliffs and has few indentations, but the south-east coast is more hospitable, with a number of sheltered bays and anchorages. In this area there are many traces of human settlement reaching back to the Neolithic times. The population, mostly farmers and fishermen, live almost exclusively in the fertile southern part of Alonissos. On this side are the lovely little port of Patitiri and the Chora of Alonissos, formerly the chief place of the island, which was largely abandoned after and earthquake in 1965. Commandingly situated above the sea, with extensive views, the village is now increasingly being rehabilitated for tourists. Off the south-east coast of Alonissos, separated from it by a wide sound, is the bare island of Peristera (Xero). Both islands have an abundance of good and attractive anchorages which makes this area ideal for sailing holidays. Moreover, two ports - Steni Vala and Patitiri - are beautifully located and will offer most provisions. Further south-east is the island of Skantzoura (not indicated on the map), which belongs to the Monastic Republic of Athos (Chalkidiki) and is used for the grazing of goats. Skantzoura has a couple of Meltemi-proof anchorages and yachts are permitted to visit. Ancient Ikos is believed to have been at Kokkinokastro (Meaning: Red Castle), near the south cape of Tzorti Bay, where remains of town walls and tombs have been brought to light. From the anchorage of Tzorti it is only a small walk to explore this site. At Agios Dimitris there are ruins of an unknown ancient city, and at Agios Petros there is a sunken Byzantine ship.